This entry was posted in Information, Shaun Wright and tagged Harry Harpham, Jahangir Akhtar, Labour, RMBC, Shaun Wright, SY Police & Crime Commissioner by Rik. Bookmark the permalink. I think the Sheffield public would actually agree with the South Yorkshire chief constable on this matter, I would love to hear more of what he said. How can you agree with someone and then admit you don’t actually know what he said. Try searching for it using Crompton apology should do it. Rothpol is interested in the politicos, not the police, there is a huge difference! 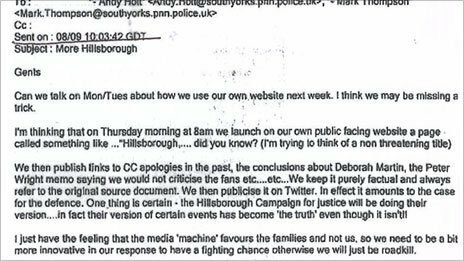 It was sent to Assistant Chief Constable Andy Holt (also ACPO lead for football policing matters), and Mark Thompson, Head of Media at SYPolice on 8th September 2012, four days before the Hillsborough Independent Panel Report was released. The offensive email was ordered to be disclosed by the South Yorkshire Police & Crime commissioner, Shaun Wright, following a Freedom of Information request by the Daily Star’s Jonathan Corke. … and a blogger’s comprehensive file on our current SY Chief Constable. I think I remember you writing that your dad was a cop. There are lots of good ones! There is also something that has become known as the “canteen culture”. There are also some really nasty ones. Not an auspicious start for the South Yorkshire Crime Commissioner, he will have to learn and learn fast that the buck stops with him. £80k a year for this level of incompetence, goes to show what happens when politicians get involved in policing. So you are slagging the PCC off because he took action. I’m guessing you’d have slagged him off if he didn’t too. I’m no fan of labour but this post smacks of desperation. I would have expected that an individual on that salary band would have had the gumption to deal with the matter without having to asking someone else to do the job for him. Not a political point, just fed up of individuals being appointed above their competence and having to pay PAYE to fund their lavish salaries. What it does say is that Crompton is as bad as his predecessor. I am sure the people of Sheffield will be horrified at his hypocracy and just want the truth about Hillsborough to be brought out. Duckenfield and his like will probably never be brought to book for their actions and lies, but for the Chief Constable of South Yorkshire to continue to defend what happened at Hillsborough is indefensible.